“So many people want to join mediation teams without having worked on the micro-techniques of mediation. These may seem far removed from bringing warring factions together. It relates more to the normal management of human interaction in conflict. These techniques have to do with the way you hold yourself; the way you listen; and the way you recognize where people have a common interest (…)” Nicolas ‘Fink’ Haysom, South African mediator in Burundi and Sudan and former UN Special Representative for Afghanistan. “The real point is that in mediation temperament trumps technique. (…) The right temperament is manifested primarily in the innate ability to listen to negotiators, to understand, absorb and even feel what they say about themselves and what they want. Let us call these the empathetic skills.” Álvaro de Soto, Peruvian diplomat and former UN Under-Secretary-General, who was a mediator in numerous peace processes. Mediation within peace processes is increasingly based on professional standards, and yet the personal attributes referred to in the quotes above are still not integral to political actors’ understanding of mediation. In organizational and family mediation, the mediator’s style is generally seen as very important. Given the constraints of realpolitik, however, it is hard to imagine that attitude and communication behaviour might have an important bearing on mediation processes in the political arena. Nevertheless, a number of factors suggest that this is the case. “I handed him the photographs. He took them and thanked me. Then he happened to look down and saw that his granddaughter’s name was written on top of it. He spoke it aloud, and then looked at each photograph individually, repeating the name of the grandchild I had written on it. His lips trembled, and tears welled up in his eyes. (…) We were both emotional as we talked quietly for a few minutes about grandchildren and about war”. 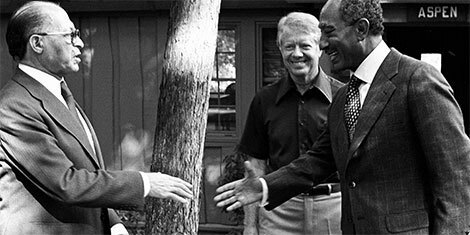 Jimmy Carter, former US President, describes a moment when peace negotiations between Israel and Egypt at Camp David appeared to have broken down after the Israeli President Begin announced his departure. Previously, Begin had asked Carter to sign photographs for his grandchildren. Carter researched the names of the grandchildren to make the dedications more personal. On seeing the signed photos, Begin decided to stay. The negotiations were concluded successfully. Social constructivist approaches to political science provide further references to support the relevance of empathetic skills. For instance, Wong  points out that in diplomats’ face-to-face interaction it is crucial to decode emotions in order to be able to gauge the other side’s intentions and priorities. He gives an example by mentioning the ‘back channel’ between Robert Kennedy and the former Soviet ambassador Dobrynin during the Cuban missile crisis in 1961. The correspondence between Dobrynin and Khrushchev suggests that Kennedy’s expression of emotion at the confidential conversations greatly influenced the Soviet assumption that they could trust the US proposals on the unofficial linking of the Soviet removal of missiles from Cuba with the United States’ subsequent removal of its missiles from Turkey. If this holds good for bilateral discussions, it must surely apply to mediation as well. Consequently, there are many paths towards an approximation of political de facto mediation and principle-led mediation. Steps in this direction are needed from both sides. This Blog post is a condensed and translated version of an article published by the author in the German Mediation journal Spektrum der Mediation. The original can be found here. Letters to a Young Mediator. A collection of 10 letters from some of the great mediators of our time. Swisspeace and Swiss Federal Department of Foreign Affairs, Bern 2015. Dirk Splinter co-directs inmedio – institute for mediation. development. consultuing (www.inmedio.de). He is a mediation trainer since over 15 years and conducts mediation processes not only in peacebuilding and development contexts but also in business and organisational conflicts. Dirk has been involved in mediation and dialogue projects in several post-war or transition countries like Egypt, Nepal, Ethiopia, Ukraine. He represents inmedio in the Initiative Mediation Support Germany (www.peace-mediation-germany.org), an informal network which supports the German Foreign Office in its efforts to promote peace mediation.